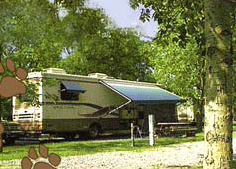 Located within minutes of Historic Lewiston and Niagara Falls, enjoy the best camping accommodations in the area. Owners Leigh Ashley and Fran Prior will make sure your stay is pleasant and enjoyable in their 1 & 2 room Kamping Kabins, or their RV sites with up to 50 Amp service available, or the rustic tent camping sites. The Riverside Motel is a quaint, vintage motel dating back to the 1950’s. It was originally located in Artpark at the foot of the old suspension bridge to Canada. In the 60’s, it was brought down to its present location. We are located in the heart of Lewiston’s historical water district, overlooking the Niagara Gorge. All ten rooms are non-smoking with private baths. The unique decor includes rocking chairs, knotty pine walls and antique replicas. Our large front yard is perfect for relaxing and taking in the river breeze. The motel is within walking distance to fine and casual dining, Artpark, jetboats, shopping and the boat launch. If you prefer to do your own cooking, we do have two efficiency units available. Our family owned and operated motel looks forward to your visit. Established in 1992, Whirlpool Jet Boat Tours is an exhilarating white water experience on the Niagara River with awe-inspiring scenery and historical significance. Passengers can choose between either a “Wet Jet” or “Jet Dome” experience. Riders on the “Wet Jet” tour must be at least 6 years of age and 44″ tall. Hydrate your senses as you prepare for Class 5 white water that’s guaranteed to leave you absolutely soaking wet and amazingly refreshed on a hot summer day. For thos e who would rather stay dry or take great photos on their Jet Boat tour, there is the Jet Dome boat. Tours depart daily from the Water Street Landing in Lewiston, N.Y., the Niagara Glen in Niagara Falls, Ontario, as well as the King George III Inn in Niagara on the Lake, Ontario. Theatre in the Mist, Inc.